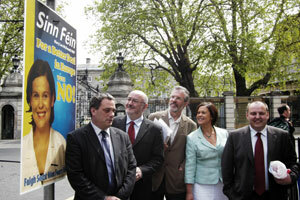 SINN FÉIN launched its campaign against the Lisbon Treaty on Monday. Party President Gerry Adams was joined by Dáil leader Caoimhghin O Caolain TD, Dublin MEP Mary Lou McDonald and campaign director Councillor Pádraig Mac Lochlainn for the launch in Dublin. Mary Lou McDonald said that whatever happened when people in the 26 Counties vote on 12 June, the state’s place in Europe is secure. “The government has cynically tried to play on people’s fears in an effort to avoid real debate on the contents of the treaty. The fact is that the Treaty is a bad deal for Ireland. It will reduce our political strength, further undermine neutrality and is bad for the economy and workers’ rights”, McDonald said. At the launch it was pointed out that the Lisbon Treaty will significantly reduce the influence of smaller states within the EU in three key areas - loss of a permanent Commissioner and 50% reduction in voting strength at Council, additional powers for EU institutions including the removal of more than 60 vetos for member states and Article 48’s new procedure which will allow the European Council to amend existing treaties without recourse to referenda. “Combined, these changes mean that Ireland will have less influence in the design of future proposals, less votes in key decisions, and a reduced ability to block decisions that are not in Ireland’s interests” Mary Lou McDonald told reporters. She said that while government ministers had tried to argue that this streamlined approach will be good for Ireland, the loss of power involved would put the 26 Counties on the margins of Europe. “For a small country like Ireland it is vital to have a permanent Irish voice at the European Commission especially when you consider that this state will only have 12 MEPs and our voting strength on the Council of Ministers will be halved if Lisbon is passed. “While the larger states will also be rotated on the Commission, Britain, Germany and Italy almost double their voting strength on the Council of Ministers and have far more MEPs than Ireland. The Commission is the one place where each country regardless of size has an equal say. Ireland’s representatives on the Commission have played a crucial role over the years. And no matter how good a relationship the Irish government builds with EU Commissioners from other states it is no substitute for an Irish voice at the table. “For generations this state has prided itself on its position as a military neutral and also as a symbol of peace keeping in conflicts through its commitment to the United Nations. Successive EU treaties and government policy have gradually undermined this position with efforts to create an EU common defence policy. The case has yet to be made for why the EU must have common EU foreign, security or defence policies or a diplomatic service, yet this is exactly what the government are asking us to sign up to. “The Lisbon Treaty will result in greater amounts of Irish taxpayers’ money being spent on Irish and EU military capabilities. It will further consolidate the EUs control over foreign and security policy. It will allow for the emergence of mini military alliances of member states and for the first time the EU will have its own Foreign Minister with a diplomatic corps who will oversee such policies. “Any political party or government who argues that all of this does not affect Ireland’s neutrality either does not understand the Treaty or simply does not care”, McDonald said. She said that contrary to the government’s claims, Article 48 removes an important protection against tax harmonisation. “Article 188 removes the government’s veto to block the kind of international trade agreements currently being negotiated by Peter Mandelson at the WTO. And both Articles 188 and 16 give the EU new powers to compel member states to open up their public services, such as health and education, to competition, bringing with it both privatisation and inequality. “At a time when our indigenous businesses, especially small and medium sized businesses need support, the Lisbon Treaty will hamper their development. At a time in which rural Ireland needs a fair deal at the WTO, the Lisbon Treaty will undermine our ability to protect the farming economy. And at a time when our public services are crying out for investment, the Lisbon Treaty promotes the kind of approach that has led to the two tier systems already in place in this country. “There are those who argue that there is no Plan B. This is nonsense. It is possible to get a better deal in Europe if the Irish people vote no on June 12th and send the government back to the negotiations. 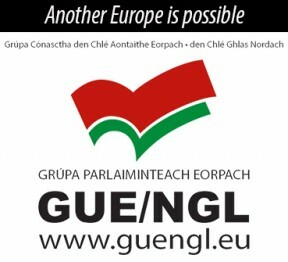 Essential to any new Treaty for Ireland is to keep a permanent EU Commissioner and maintain our voting strength, a specific article protecting neutrality, protocols reserving this state’s right to continue making its own decisions on taxation, an article specifically exempting health and education from competition and privatisation and protections for workers’ pay and conditions. “For a better deal for Ireland and for a better deal in Europe Sinn Féin is urging voters to say No to the Lisbon Treaty on June 12th”, she said. Sinn Féin Dáil leader Caoimhghín Ó Caoláin TD, Senator Pearse Doherty and MEP Bairbre de Brun launched an information guide outlining the impact of the Lisbon Treaty on Ireland’s rural economy on Wednesday. The guide also addresses the implications of the Lisbon Treaty on international trade and Irish agriculture. Caoimhghín Ó Caoláin said the treaty reduces Irish influence in the EU and that, if passed, the 26 Counties would lose important vetoes. He said the loss of an Irish Commissioner for five out of every 15 years and the reduction in Ireland’s voting strength by 50% at the European Council will reduce Ireland’s influence in Europe. “Further review of the Common Agricultural Policy is likely after 2013. This means that future discussions at the Commission could take place without an Irish voice at the table. It also means that our voting strength at Council will be reduced while states such as Britain and Germany will increase. How could any of this be good for Irish agriculture?”, said Ó Caoláin. “Article 188 of the Lisbon Treaty outlines the rules for the negotiation and conclusion of international trade agreements with non-EU countries and international organisations like the WTO. This article makes a number of important changes from the current situation. Ireland’s remaining vetoes in areas such as trade in services and intellectual property are either removed or made so conditional that they are rendered useless. “The IFA and others have rightly called on the government to state publicly that if the current round of WTO negotiations are bad for Irish agriculture that they will veto the deal. However Article188 removes the grounds on which such a veto could be used. The WTO negotiations are unlikely to conclude before the Lisbon Treaty is ratified. That means for Irish farmers that if the Treaty is ratified there will be no veto available to the Irish government leaving them unable to veto the deal. This is a bad deal. Sinn Féin is calling on rural Ireland to reject the Lisbon Treaty and send the government back to the negotiating table. A better deal is possible”, he said.